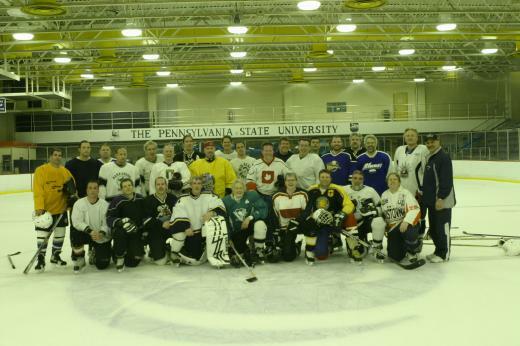 Joe Battista and The Nittany Hockey League, Happy Valley’s adult hockey league. jst sgnd gift agrmnt, gr8 day 4 hky in Hpy Vly! If I know the Pegulas as well as I do, they will only do more in the future. Let’s hope that by properly thanking them for this gift they will decide to do it in Central Pennsylvania. This amazing act of philanthropy will provide a world-class venue for our area. It will create jobs and make a significant economic impact on the region as thousands flock to Happy Valley to see professional ice shows, such as Disney on Ice; professional hockey games with NHL and AHL teams; figure skating; and local, regional and national hockey competitions. The state of the art double-sheet ice arena and practice rink will be used by adults and kids of all ages for ice skating, hockey, broomball, speed skating, curling and more. Open 7 days a week, between 15-18 hours a day, the facility will serve more than one million patrons annually. Lou Prato, a good friend and terrific writer, has discovered that Penn State was among the very first college teams to ever play a hockey game back in 1909. I am more familiar with the well-documented era from 1939-1946, when varsity hockey existed in Happy Valley. We are now very close to a return of varsity hockey and those heady days of George Wolbert, Johnny Dufford, Peany Gates, and Larry Lightbody, Jim O’Hora, and Doc Davis! a faithful wife hadn’t showed up at a hockey management meeting in 1980 and stood by this crazy old hockey guy for the past 20 years. All of these people played an important role in bringing us to today. Of course, it’s the generosity of one of the most passionate hockey fans I have ever met (and his family’s support), and the hard work from Penn State administration, development, and athletics that are ultimately responsible. Personally, it is a dream 32 years in the making. It took a lot of passion from dozens of people to make it reality. With the risk of sounding overly dramatic, it was quite the coincidence that we spent the morning of August 25 with the 1980 U.S. Olympic Ice Hockey Team Captain Mike Eruzione, who was giving us a tour of Agganis Arena at Boston University. He scored the winning goal that led to Al Michaels’ famous call: "Do you believe in Miracles? YES!" Thanks to everyone who helped make this impossible dream come true.